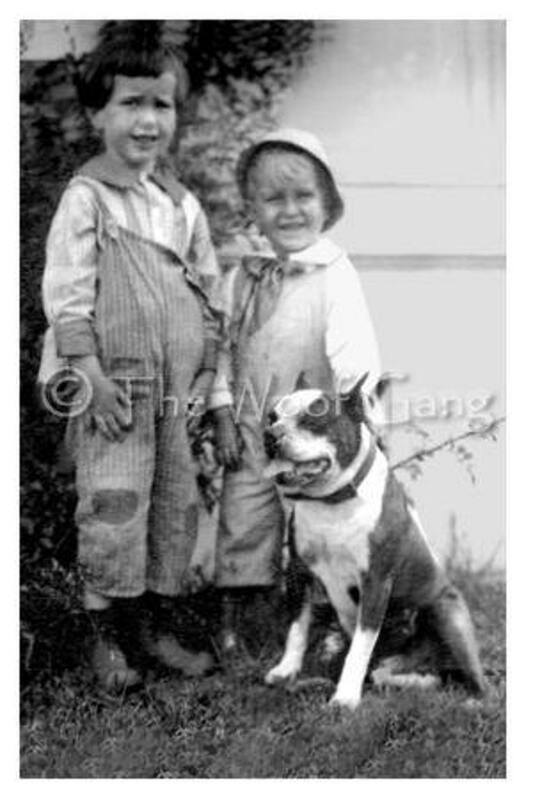 A little known fact, Pit Bulls were considered America's favorite dog from around 1860 up to around 1930. It was viewed as a faithful guardian of children and homes and were as common and well loved as today's Golden Retrievers. Teddy Roosevelt bred Pit Bulls and was responsible in part for the breed's popularity at home and hearth. Unfortunately, it was also highly regarded as a fighting dog. The "sport" was actively and openly popular, even Roosevelt was an avid participant in the "game". When not in the pit or the ring, the breed was to be found as a companion across the population from the richest and the most powerful down to the poorest of the poor. The two boys in this photo were clearly not affluent, yet they were as closely bonded to their dog as Teddy Roosevelt and Alice Anderson (see Alice in another photo) were to their dogs. And that's what's wonderful about dogs, they don't care how much money you have, your love is all they need.